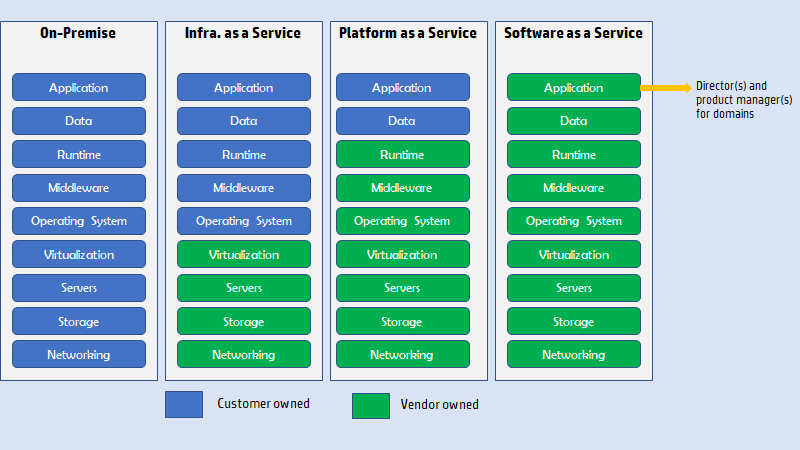 There is a well known diagram of a software stack that describes the differences between SaaS, PaaS, IaaS and on-premise deployments. Among other places, you can see it on Microsoft's Azure Learning site and on BMC's blog site. 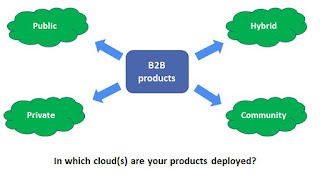 I have modified it a bit to show the role of business product managers in SaaS applications. Looking at the diagram below from left to right, you can see how business cost and value for the customer is shifted from owning to renting, or Cap-ex to Op-ex. Additionally, in SaaS, the only experience layer the client's users interact with is the application layer. And given the tiny footprint of the rented SaaS application, clients can no longer access the remaining layers. The user experience of your SaaS application is bench-marked against every other web property. It is no longer possible to have navigation that is broken, or clicks that go nowhere. For a consistent user experience, use UX templates. Customer journeys must be created and designed for the smoothest user experience assuming that every touch point is accessible in real time. Because user engagement must be similar to the web or mobile app experience, it is important to have real-time feedback for every action. A wizard or widget must actively engage a user, let him complete his task and show feedback. At the same time,features related to real time user to user interaction, such as a chat widget or an IM become important even for SaaS applications. These are in turn managed either by the application support team, by the service provider, or by a 3rd party vendor. Product managers must consider how to handle and prioritize such features. With SaaS, you are essentially handing over all data and meta-data about your company and employees, vendors and users to the service provider. Consequently, system architects managing the complete stack will figure out a solution to meet business and compliance requirements. This depends on the application's security posture, and time and investment planned for compliance and risk management. This activity either leads to backlog requests for adding new features related to privacy and security to your bucket, or it leads to investing time and resources to make sure that your features are compliant with the final architecture. As a PM, you are pretty much looking at the top layer of the cloud stack. However, internal teams such as delivery, support, training, pre-sales, marketing will also have their own application stacks, without or without access to a live customer deployment. If as a PM you do not include features to make their work life easier (e.g. delegate access to customer environment) it will impact their capabilities on the application, which will hit your C-SAT objectives. So you talked to dozens of key clients, identified all top features and prioritized the business requirements. This is no longer the end of the product specifications handover to engineering. You must breakdown the requirements into technical specifications and continuously track their delivery into the cloud application. With a CI/CD pipeline, the Product Owner takes care of this aspect of inward product management. However, the product manager still owns the UX and customer feedback. Net result, it is common place to find both roles in a cloud organization, with the PO reporting to a PM or a Director. Last year saw a lot of changes in the Indian product space. If you have been following the news sites, you will know about many of them. We had the Walmart-Flipkart deal, which also has people saying that this was a bad buy. The government has finally tightened norms on various practices followed by e-commerce firms. Multi-billion dollar valued Ola has actually invested in another mobility startup Vogo. This is surprising considering that Ola is actually large enough and capable enough to launch their own business unit in this space. And the online delivery space has seen a lot of action from investors, which included Swiggy's $1 billion funding. Accordingly, hiring in the technology industry has also picked up, with a lot of movement at both senior and junior levels. Bangalore remains a perennial favorite, but Pune, Hyderabad and Gurgaon are not far behind when it comes to people's preferences. In addition, the B2B software space has finally matured, with a lot of new firms focusing only on the cloud based services, for all departments in an enterprise, from finance to sales to marketing to HR and customer service. It is not difficult to find many new ventures or existing firms that have done well in this space. And I cannot recall many firms that are still doing packaged on-premise software for clients. The consumer internet space has also exploded, there are a lot of exciting new ventures. These startups are exploring business models, technologies (IoT, Blockchain, Gaming, Reality TV) delivery mechanisms (app only) without losing the focus from a scalable revenue model. India has become an exciting destination for new ventures and finally there is some focus on innovation as well, rather than the traditional IT outsourcing (which has also matured significantly). Here's hoping for a fantastic 2019!! A product manager/owner is typically responsible for the functional specifications developed by the engineering teams. However, for cloud deployments, one should also consider the non-functional requirements (scale, security, data confidentiality & isolation etc.) that can impact the use cases offered, as well as the business, financial and legal requirements of offering the product and services in different environments globally. Sometimes the last 3 capabilities may be covered by service delivery teams via paid engagements. And in smaller firms, these teams can be outsourced, distributed or merged with other cloud teams. For the success of your application, it is important to make sure that these customer-facing and operational teams are successful in their tasks. So apart from regular engineering interactions, you may also have to allocate time and resources to engage these stakeholders. These cloud teams are supporting your application, and there is a symbiotic relationship between development and cloud teams. Do not underestimate their significance. 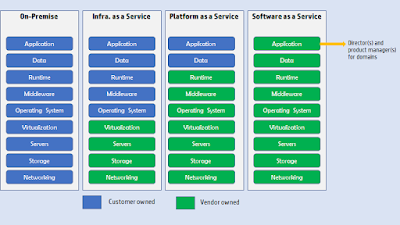 Application architecture is very different from cloud-based deployment architecture. Listen to your cloud architects and mediate between architect teams as required. If the cloud supports multiple products, your cloud architects may rule. If you have a team of product owners reporting to you, keep at least one PO focused on cloud platform requirements. From time to time, these requirements can impact your backlog, leading to delays in delivery. Keep demoing your application to all these stakeholders. Sometimes it can be via hands-on access in a sandbox, but you can also hold a brown bag session to explain new features or enhancements. Whenever possible, keep sharing customer feedback with the cloud teams. With their focus on ops, up-time, performance etc. they sometimes miss the point of why the cloud exists in the first place. As a product manager, you will have to make presentations that indicate timelines, progress, status, resource utilization etc. Unless your firm has a standardized template for these, making such slides gets tiresome. While there is never a perfect timeline slide for all occasions, I have created the attached template, that can be useful on many occasions. There are 3 slides in this template, that can be used in different ways. Feel free to modify or use them in any way. Tip: The long term monthly slide is useful for communicating with senior management, to show the big picture. 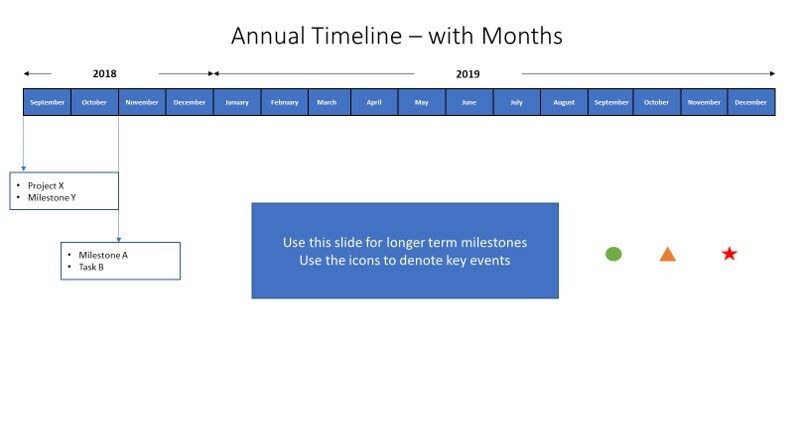 This slide is useful when you want to show a long term roadmap with key milestones called out. This is typically used for marketing, or for summary presentations to senior management. For example, you can use this slide to show when the product concept will be defined, engineering specs delivered, marketing tasks completed and the new version released over 18 months. If you want to add more details, then you would add rows indicating different people or departments where these milestones will occur. Sometimes, you have to show the weekly progress being made towards internal milestones. This slide is typically used when you want to show when each feature is being released. The attached slide shows a timeline over 3 months, and is formatted for the 52 week calendar year. Again, if you want to provide more details, add rows of data for the audience. 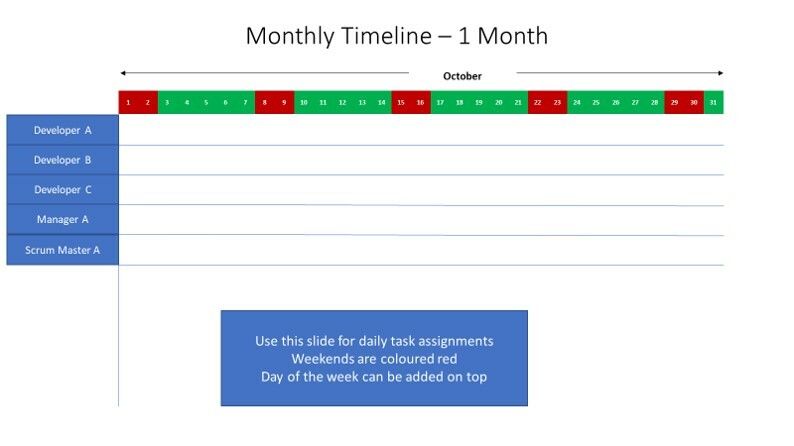 This slide is useful for showing tasks to be completed within a month. You can show each day, and exclude weekdays, while indicating when each task is to be completed, using icons from slide1. I have used such slides to show the cross-functional deliverables for a product, when there is a tight deadline to be met. Apart from this, you can also color holidays or internal "dead" days. So will you ever use all these slides in a single presentation? Unlikely, as these are meant for different audience. How is an enterprise software product planned, designed, built and released? For a large software vendor, there are several processes and departments that work together to create a product that can license for hundreds of thousands of dollars. This takes a lot of planning, time and effort across multiple functions. In addition, there can be delays and risks in developing such software. PLM software is available in the manufacturing domain, from vendors such as Siemens, Oracle, Autodesk and many others. These describe how different functions and processes are used to release products and support customers. One such PLM diagram that I created is shown below. Each department in a firm is shown as a swim lane. And there are different product life cycle phases that run from left to right over time. The flowchart depicts the different activities that occur within the cycle, and the different checkpoints that occur. You can observe the complexity that a product manager for enterprise software handles, compared to what the simplified role of a product (feature?) manager is in the e-commerce or web world. In my career, I have attended a mind-boggling number of meetings where my stakeholders are absolutely clueless about the role of a product manager (especially someone working in India). And these stakeholders have been from engineering, sales, field marketing, program management and many other teams. So a lot of time is then spent on explaining what a PM does and why that is useful to their team/their own goals. Here’s my approach towards enlightening the clueless stakeholder verbally. Note: I am not in favor of sending email blasts, unless most of your stakeholders are not in the same location. Without stereotyping too much, an engineering manager would have a very different personality and skill set from an account manager. So we need to identify what facet of a PM’s role he would be interested in. For e.g., if an engineering manager wants the product roadmap, he is probably looking for details on proposed features, that his team needs to prepare for. He wants information on what are the technologies of focus, what are the skills his team needs and so on. However, if an account manager wants to know about the roadmap from the PM, it is likely that he is looking for a competitive edge while positioning the product to his account. He is looking for something to sell to the account. So you should focus on only the business value of your roadmap. If you are part of a new setup in India, then you may only need to mention this fact, and that you will be carrying on all existing activities and initiatives. For most stakeholders, this is enough. If you are working with remote stakeholders then be ready to do a lot of follow-up over emails and IM and meetings. I have found that those stakeholders are the hardest to influence. Typically, such stakeholders include C-level leadership, who really need convincing on why someone 10,000 miles away is useful to them. If you meet a skeptic, then the best option is to offer examples and success stories about the benefit of having a product manager in their midst. For example, if the company is facing pricing pressures, then show, with examples, how product managers can create pricing strategies and the impact on margins. The challenge here is that you might need to make space to accommodate your role, which means reducing the role of someone else. That someone else is unlikely to ever become your champion, so you need to keep a close eye on such stakeholders. End of the day, a PM is expected to lead the virtual, cross-functional team towards successful software and hardware releases. He is also expected to be the key expert on customer needs. If you have something unique that you can share, then you must do so. I remember a time when I was asked by engineering, why I’m the right fit for the role in the first meeting. In response, I listed down multiple planned improvements for the product, and the outline of a high level PRD. This gave that team the comfort that I am capable of doing the work, even though I have an MBA from IIM Ahmedabad. Sometimes, that is all you need. For some people, negotiation or public speaking classes can help them increase their communication effectiveness. If these courses are available to you, do check them out.